And between 'proper' jobs, over the summer, he was taytie farming on his new John Deere tractor, working in the fields from 5 a.m. to 7 p.m. He was thinking of diversifying into muck-spreading, then the truck-fitting job came up. 'I'm wearing everything out, my brain, my body, personal relationshipsa Why? I don't have an answer. Other than I want to break myself. Then what? I believe the body is a fantastic thing and it will repair itself and I'll go again.' 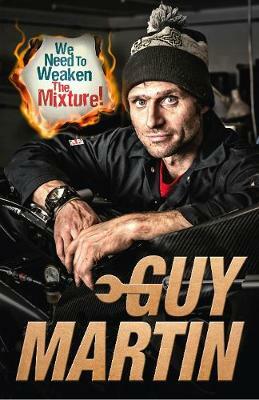 This year Guy Martin is restoring and racing a 1983 Williams F1 car; he's attempting the land speed record in Bolivia; he's going for the fastest ever Channel crossing; he's customizing his Ford Transit for record-breaking circuits around Nurburgring, and he's building a Typhoon. That's exciting - it has to be, otherwise he wouldn't do it. But it's TV stuff. It's not real graft. Real graft is his 70-hour week mending trucks for a local haulage firm. And between 'proper' jobs, over the summer, he was taytie farming on his new John Deere tractor, working in the fields from 5 a.m. to 7 p.m. He was thinking of diversifying into muck-spreading, then the truck-fitting job came up. Oh yes - and besides the day job and the TV, he's bought his local pub, and the most terrifying he's ever done is sing on stage (out of tune) in front of the Kirmington crowd on New Year's Eve. Only Guy lives a life like this, and only his stories, in his own words, can do it justice.